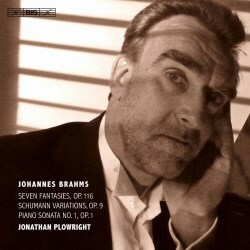 This is the fifth and final volume of Jonathan Plowright’s excellent set of Brahms’s piano works, and by the looks of the cover photo he now seems pretty desperate to be released from that room with the slatted blinds. Excellent SACD sound quality has been an attraction for this series, and I’ve been sure to acquire any of the volumes that haven’t come my way for review. Plowright takes the opening of the First Piano Sonata with measured weight, slower than Barry Douglas (review), but giving space for the developing dramatic contrasts and the beatific moments in the middle of the movement. This is a ‘symphonic’ approach, and with a touch to back up the eventful content of this remarkable Allegro there is nothing to complain about, and in the end Plowright’s purposeful momentum is only about half a minute longer than Douglas. Plowright creates an atmosphere of stillness and devotion to open the second movement, phrasing the variations on that ‘altdeutschen Minneliede’ with gorgeously reflective introversion. Symphonic Brahms re-awakes in the Scherzo, the impact of its ‘tutti’ chords interspersed with witty interjections, and a con fuoco that suggests sparkling fireworks as much as it does fiery extremes of expression. The Finale is a moment for the pianist to let their hair down to a certain extent, though the demands of the writing also require absolute control over wide leaps, Plowright impressing with pin-point accuracy and a charmingly unashamed ability to bring out Brahms’s almost cheesy romantic salon moments. This youthful sonata was the one that Brahms played to Robert and Clara Schumann at their first meeting in 1853, and placing it near the Variations on a Theme by Robert Schumann is something this release shares with the Chandos recording with Barry Douglas mentioned earlier. These earlier works sandwich the Fantasies Op. 116 that are late Brahms at his best, Bryce Morrinson in his booklet note summing them up as forming “an incomparably rich reflection of bitter-sweet nostalgia, that Brahms hallmark, shot through with bold, fist-shaking declamation.” Comparing SACD challenger Denis Kozhukhin on the Pentatone label (review) makes me appreciate Plowright’s skill in delivering convincing performances while allowing the music to speak for itself as much as possible. Kozhukhin is also impressive, but pulls things around more – not quite to the point of a disturbing distortion of the text, but to my mind obscuring Brahms content behind the profile of the performer. I feel more in touch with Brahms with Plowright, though am quite happy to admit the subjective nature of such comment – no-one really knows how he would have played these pieces himself. Compare that unforgettable fourth Intermezzo in E major, where Brahms’s hesitant longing unfolds with understated poetic delicacy from Plowright, where Kozhukhin starts leaning on things right from the opening cadence, losing out on the contrast between that statement and its song-like reply. The following Andante con grazia ed intimissimo sentimento is given a core of urgent secretiveness by Plowright, where Kozhukhin spreads out to a good 45 seconds longer in more of a languorous warm bath than something that can have portent and hidden meaning. The Variations on a Theme by Robert Schumann is as good a place as any to end your five-volume set of Brahms’s piano works, and Plowright’s sensitivity to this “haunting tribute by one composer to the tragedy of another” is superbly presented: paced with the silver thread of that emotive theme holding together a charm-bracelet of musical nuggets that are mostly less than a minute long. Spectacular pianism is well in evidence, but it is the quiet stillness of moments such as Variation VII that are the most memorable. Returning to Barry Douglas on Chandos reveals how different artists can have entirely different and equally valid narratives on the same few bars of music, Douglas taking us through different scenes like pictures at an exhibition where Plowright seems keen to explore the psychology within each variation. This is a very fine conclusion to a superb set of Brahms’s piano music, and an excellent release in its own right. I can’t imagine anyone coming into contact with any one of these CDs not wanting to own the complete set sooner or later, but with its contrast between the younger and elder Brahms this is as good a place to start as any if you have yet to discover the joys of this series.